I know that for most, chocolate chip cookies are the epitome of nostalgia, but for me it's snickerdoodles. My mom had a Mrs. Fields cookie cookbook, and snickerdoodles were most definitely the favorite cookie in the book. I remember carefully rolling each ball of dough in cinnamon sugar, then watching them spread and bake in the oven. The smell of snickerdoodles can't be beaten, and the cookies themselves are pretty fantastic as well. I love the crunchy outside that gives way to the soft and chewy interior. It really is just pure comfort food for me. As I was flipping through The Smitten Kitchen Cookbook (!! ), I literally gasped when I came upon these bars. They are a combination of snicker doodle, creme brûlée, and St. Louis gooey butter cake. I mean, come on. If you're unfamiliar with gooey cake, it is basically a yellow cake base, with a gooey, buttery topping. It's pretty much one of the best things ever. This version has a cakey-cookie base, topped with that decadent gooey topping as well. However, it goes over the top when it's sprinkled with cinnamon-sugar, which creates kind of a creme brûlée effect - crunchy, sugary, but with that wonderful warmth from the cinnamon. These are pretty much completely irresistible, and I foresee them being on the dessert table on Thanksgiving. And Christmas. And New Year's. And MLK Day. I think you get the idea. Preheat the oven to 350 degrees. Line the bottom and sides of a 9x13 inch cake pan with foil or parchment paper, then spray liberally with cooking spray (or grease with butter). Set aside. To prepare the cookie base, whisk together the flour, cream of tartar, baking soda, cinnamon, and salt in a medium bowl. In the bowl of a stand mixer fitted with the paddle attachment, cream the butter and sugar at medium speed until light and fluffy. Add the egg and milk and beat until combined, scraping down the bowl and then beating for another 10 seconds. Beat in the dry ingredients at low speed until just combined. Dollop the cookie base over the bottom of the prepared pan and spread it into an even layer with a butter knife or offset spatula. Set aside. To prepare the gooey layer, whisk together the corn syrup, milk, and vanilla in a small bowl. Set aside. In the bowl of an electric mixer, cream the butter, sugar, and salt until light and fluffy. Beat in the egg, scrape down the sides of the bowl, then beat another 10 seconds. Add 1/3 of the flour and mix, followed by half the vanilla mixture, mixing well to combine. Repeat again, twice, until all of the flour has been added and mixed until just combined. Dollop over the cookie base and spread carefully with an offset spatula. Mix the sugar and cinnamon together in a small bowl, then sprinkle over the gooey layer. Bake 25 to 30 minutes until the cookies have bronzed on top. The gooey layer will rise and fall in the oven, but wills till be a little liquidy under the cinnamon crust (Definitely ere on the side of under baked rather than over baked in order to maximize the gooeyness!). Allow to cool completely on a rack, then cut into squares to serve. I made the marbled pumpkin cheesecake from the SK cookbook today! Somehow haven't come across these bars...but I'm going to seek them out now that I know they exist. They look damn delicious. As if I needed another reason to get this book. Being a St. Louisan all my life, I can attest for just how fantastic Gooey Butter Cake is. Since Snickerdoodles are mine and my husbands favorite cookies, these will have to be made VERY soon! Snickerdoodles in gooey bar form?! Yes, please! Oh my...Have to put that book on my wish list. I have the Mrs Fields book for many many years and the snickerdoodies fly off the play when we made them. Can't wait to try this. I stopped in my tracks when I saw this recipe in the book, too! It looks so good! I need to get my hands on a copy of that book if this is any indication of the good stuff in it! These look delicious! 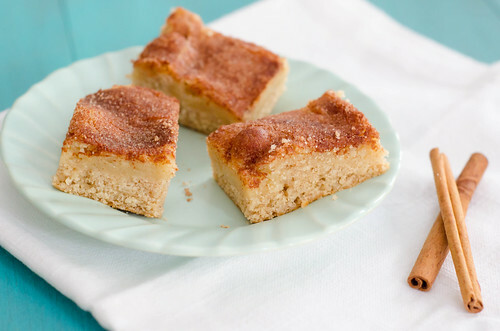 gooey butter cake - you had me there...and I love cinnamon so I am sure these are totally ok for breakfast! Man, those look/sound/must be delicious!! Gotta make a batch soon! So from the moment I saw this recipe on foodgawker to when I made them was just the time it took for my butter to defrost. These are awesome. I don't think I've ever had gooey butter cake before...it was like this custardy amazing layer. Thank you for the recipe, I'm definitely getting this cookbook! sounds great! love the gooey layer! I enjoy eating gooey stuffs. Its more appetizing and fun. It makes you crave for more. I loved Snickerdoodles as a kid, and Mrs. Fields' recipe is my go-to version today! I am definitely looking forward to trying these bars. They look and sound delicious.